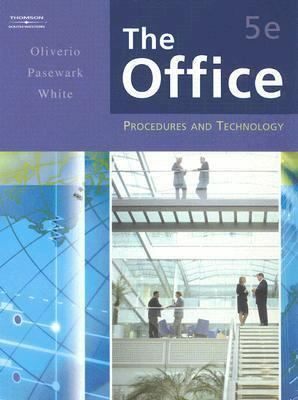 by Oliverio, Mary Ellen, Pasewark, William R., White, Bonnie R.
Oliverio, Mary Ellen, Pasewark, William R., White, Bonnie R.
THE OFFICE: PROCEDURES AND TECHNOLOGY is a comprehensive office procedures text for high school students, which provides essential skills for success in today's business world. The text is designed to teach knowledge and skills that are needed in a variety of careers where workers communicate, manage information, use technology, handle records, work with others, and solve problems in an office setting. The activities in the text are task-oriented, requiring students to apply knowledge and skills learned to complete an assignment or solve a problem. The text has three types of feature boxes in each chapter: Online Resources, providing information on our product Web site that relates to the chapter and professional organizations such as ARMA; Workplace Connections provide comments from fictional business employees related to material presented in the chapter; and Focus On? offering information on current topics of special interest.Oliverio, Mary Ellen is the author of 'Office Procedures And Technology', published 2006 under ISBN 9780538443548 and ISBN 0538443545. Loading marketplace prices 189 copies from $3.16 How does the rental process work?